African American emojis, AAeMojis are the perfect black emojis to light up your emotive message. 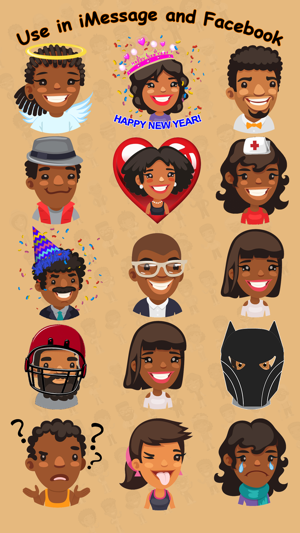 Express yourself like never before with these classy African American emojis for text messaging or for Facebook. Charming, flattering, cheerful and proud expressions show your frame of mind at just the right moment with these black emojis. 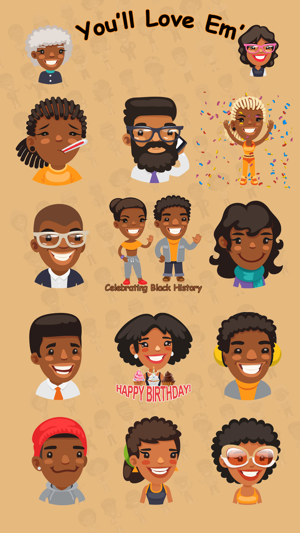 African American emojis are 133 stickers with a variety of genders and ages. Yes you get all 133 at no extra charge. Seven are animated GIFs. There's a good balance between male and female. You'll get adults, teens, and kids sporting a consistent polished look. Put these high quality stickers radiating positive karma to the test when you need just the right touch for good vibrations. 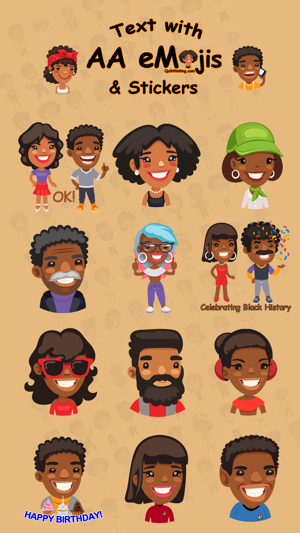 These are black emojis for text messaging and for Facebook you will want to use. Your personal or message data is safe! We don't collect it. We are required to ask permission to create a photo album and to "Allow AAeMojis (African American emojis) full access for AAeMojis Keyboards?" To get started, open the app. Swipe left to the third screen. Watch the iMessage Setup video. Then swipe to the fourth screen and watch the Keyboard Setup video. Swipe to the fifth screen for 4 ways to connect with us. Finally, you can express your true self. You'll get a lot of use out of the large variety of these very cool emoticons included in this black emoji app for iPhone and iPad. African American emojis are truly multicultural. Anybody can sport an inclusive attitude by using these colorful casual characters. You don't have to be African American to use them. If you fancy yourself as a person of color, go for it!